The magnificent castles of Japan such as Himeji, Hikone and Matsumoto are well known to visitors to Japan. 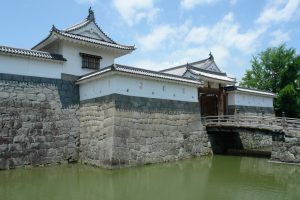 In this lecture Stephen Turnbull looks beyond these palatial fortresses to the reality of castle construction and castle life during the time of Japan’s civil wars. Beginning with the fortified stockades of the Nara Period he shows how mountains were sculpted to create the classic yamashiro of the Age of War. He also shows how castles could be protected against siege attacks, earthquakes, bad weather and of course the famous ninja. The lecture will conclude with a behind-the-scenes account of how Stephen Turnbull was involved in the design, construction and stunt filming of the replica of Kumamoto Castle built at Shepperton Studios for the movie 47 Ronin. Stephen Turnbull took his first degree at Cambridge and has two MAs (in Theology and Military History) from Leeds University. In 1996 he received a PhD from Leeds for his work on Japan’s ‘Hidden Christians’. His work has been recognised by the awarding of the Canon Prize of the British Association for Japanese Studies and a Japan Festival Literary Award. In 2008 he was appointed Visiting Professor of Japanese Studies at Akita International University, a position he still holds. Now retired, Stephen Turnbull is also a Research Associate at SOAS and an Honorary Lecturer at Leeds. He currently divides his time between an annual trip to Akita to teach and much freelance research and advisory work. His interests are focused on Japanese religion and military history and he has published 72 academic and popular books on these themes together with several journal articles. His expertise was also put to use in helping design the award-winning computer strategy game Shogun Total War, and in 2010 he acted as Historical Adviser to Universal Pictures for the movie 47 Ronin starring Keanu Reeves, a role that included helping with a full sized Japanese castle that was built on set. Dr. Turnbull’s current academic research projects include a study of Japanese mercenaries in South East Asia in the seventeenth century and a major comprehensive survey of Japan’s phallic shrines.